110 Commercial Real Estate & Properties in Winnellie are listed in 5 categories. We have 73 Industrial Warehouses Lease , 29 OfficesLease , 7 ShowroomsLease , 3 Retail ShopsLease and 1 Development LandsLease . First floor strata office unit Unit building area 64 m2 Full height glazing Amenities include kitchenette and toilet 1 car park for this tenancy Visitor car parks for the complex Plenty of free angle parking across the road also Modern commercial complex Excellent outlook presentation Fitted out with carpet floor coverings, ducted channel around the perimeter with power points and phone data points installed View by Appointment 7 Days! For Lease: $1,200.00 + GST per month For more information, or to arrange an inspection, call Nick Syrimi today at Ray White Commercial (NT) Visit our website rwcnt.com.au to view all our property listings! Strata Commercial unit area approx. 169 m2 Quality office fit out Fully fitted out full height partitioned offices Reception, Boardroom, 2x offices, plus extra large open plan area Networked for phone data all areas Air conditioning split system wall and ceiling cassettes Small storage area with roller door access Amenity includes male and female W.C and shower Exposure to the Stuart Highway traffic Plentiful car parking front and rear View By Appointment 7 Days! For Lease: $2,600 + GST per month For more information or to arrange an inspection, call Nick Syrimi today on 0412 537 638. Visit our website rwcnt.com.au to view all our propoerty listings! Warehouse and office total area 617 m2 Building 1: Warehouse 490 m2 Office area 127 m2 fitted out Qty 3 roller doors High amps 3 phase power large water main 300mm drains to each side of the warehouse Bituminised drive through with dual street access Security fenced around the perimeter Zoned DWNI2 General Industry Lease term negotiable View by Appointment 7 Days! For Lease: $48,000.00 + GST per annum For more information, or to arrange an inspection, call Nick Syrimi today at Ray White Commercial (NT) Visit our website rwcnt.com.au to view all our property listings! Ideal for the small business or Household requiring extra space for personal belongings Small storage unit 31.5 m2 Masonry block construction Motorised roller door and standard entry door Minimum lease term 6 months View by Appointment 7 Days! For Lease: $440.00 + GST per month For more information, or to arrange an inspection, call Nick Syrimi today at Ray White Commercial (NT) Visit our website rwcnt.com.au to view all our property listings! 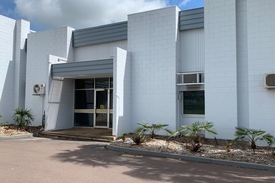 Total building area 550 m2 Front office amenities area 66 m2 Warehouse area enclosed area 403 m2 Open awning rear section area 83 m2 Three motorised roller doors 5.5 metres wide Concreted parking, driveway hardstand Security fenced around the perimeter Total land and area 1,780 m2 Well presented throughout Available now View by Appointment 7 Days! For Lease: $65,000 + GST per annum For more information, or to arrange an inspection, call Nick Syrimi today at Ray White Commercial (NT) Visit our website rwcnt.com.au to view all our property listings! This property is set in an outstanding position, encompasses quality and functionality, and is packed with features: Full live in facilities Male & Female amenities + shower (& hot water) Several self contained tiled & air conditioned offices Front and Rear electric roller door access Covered rear courtyard Full kitchen facilities & breakout area High clearance, clear span warehouse space Mezzanine office & storage space (60m2) Exclusive onsite parking Contemporary fittings & finishes A GROSS rent so you don't have to pay rates or Body Corp fees. Contact Martin Gore 0417 850 933 or mgore@dwn.mcgees.com.au to inspect today. 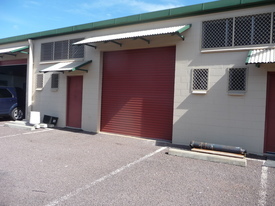 This well presented solid industrial unit provides neat tidy office and storage space well located within Winnellie. Constructed of tilt slab concrete panel it is a good secure unit. It has a fully air conditioned mezzanine office and open work area and additional work area and storage at ground level also with split system air conditioning. Well suite to the small business operator the unit is complete with kitchenette and full bathroom including shower. Affordable office and storage call today to Inspect. Total unit building area approx. 420 m2 Workshop enclosed area approx. 350 m2 Office amenities area approx. 70 m2 Amenities kitchenette 2x W.C Hardstand area approx. 500 m2 Excellent large vehicle access There two warehouses on the one allotment, one at the street front and another at the rear of the property The driveway is shared and each has their own parking and hardstand area Available mid February View by Appointment 7 Days! For Lease: $4,000.00 + GST per month For more information, or to arrange an inspection, call Nick Syrimi today at Ray White Commercial (NT) Visit our website rwcnt.com.au to view all our property listings! Unit building area 81 m2, plus mezzanine approx. 24 m2 Mezzanine office (built to code) area approx. 24 m2 well fitted out Fully air conditioned warehouse and office Combined shower W.C and kitchenette Motorised roller door 2 car parks + loading bay area on title Available for immediate occupancy Located in new complex of 40 Small to medium warehouse units in sought after Winnellie. View by Appointment 7 Days! For Lease: $1,450.00 + GST per month For more information, or to arrange an inspection, call Nick Syrimi today at Ray White Commercial (NT) Visit our website rwcnt.com.au to view all our property listings! Front office fully fitted out as open plan area 60 m2 Warehouse / factory unit area 690 m2 (adjoining warehouses) Staff room approx. 8 m2 in each warehouse Total building area 750 m2 2x wide sliding doors Hardstand area 755 m2 concrete surface Security fenced Excellent vehicle and truck access Highly visible to Tiger Brennan highway traffic Available now View by Appointment 7 Days! For Lease: $68,000.00 + GST per annum For more information, or to arrange an inspection, call Nick Syrimi today at Ray White Commercial (NT) Visit our website rwcnt.com.au to view all our property listings! Showroom/office + storage area Tenancy area 262 m2 Showroom/office area 217 m2 Warehouse storage area 45 m2 1x office Smoko room with kitchenette Shopfront glazing Lunch room with kitchenette Unisex W.C Fully air conditioned by ducted system Painted concrete floor throughout Security system installed Network hub in place Multiple car park bays including undercover Available now All uses considered Lease term negotiable View by Appointment 7 Days! For Lease: $60,000 + GST per annum For more information, or to arrange an inspection, call Nick Syrimi today at Ray White Commercial (NT) Visit our website rwcnt.com.au to view all our property listings! Unit building area 81 m2 Masonry block construction Internal height allows for future mezzanine Combined shower WC and kitchenette Motorized roller door 2 car parks + loading bay area on title Located in new complex of 40 Small to medium warehouse units in sought after Winnellie. View by Appointment 7 Days! For Lease: $1,250.00 + GST per month For more information, or to arrange an inspection, call Nick Syrimi today at Ray White Commercial (NT) Visit our website rwcnt.com.au to view all our property listings! Front warehouse facing Winnellie Road Warehouse area approx. 853 m2 Office area approx. 87 m2 Front and side yard Security fenced around the perimeter of the allotment All uses considered Available now Note : There are two identical warehouses on the complex with common driveway access. View by Appointment 7 Days! For Lease: $80,000.00 + GST per annum For more information, or to arrange an inspection, call Nick Syrimi today at Ray White Commercial (NT) Visit our website rwcnt.com.au to view all our property listings! Commercial Warehouse unit with ground level storage area and totally separate office on the mezzanine above. Office area 67.5 m2 Storage area 84 m2 Roller door for access to storage area Kitchenette W.C Allocated car parking Tilt slab construction Wide drive way access and plenty of car parking. New development ready to occupy now! FOR LEASE: $2,300 + GST per month For more information or to arrange an inspection, please call Nick Syrimi 0412 537 638 at Ray White Commercial (NT) Visit our website www.rwcnt.com.au to view all our commercial property listings! !